This question is very common and its a wish too. But nobody want to express because everybody has fear of bulk of emails in his mailbox. Most of the people are using their own email address having 10MB to 200MB per email account quota. Every hosting plan provide them a limited no. of email accounts. But there are numerous users who are using free and reliable email services like yahoo, Hotmail and Google etc. Almost all of us are having at least one account with these reliable services and using forwarders to keep our hosting space unfilled. So when we are using free services, there is nothing to worry about the mailbox quota. Now the question is this, do we really need to backup our WordPress database daily? So when we answered the above mentioned fear, then you will be interested to know about that is it possible that there should be a script which backup our wordpress database daily and email to us. Obviously a web developer or a little technical geek will question about Cron Job or a custom call script, that is again a tension for them who are busy. Here is the solution which can be wished at least, suppose there is a script which ask you to provide your email address only and that’s it. Isn’t it amazing? Yes!!! A wordpress plugin can be written which will ask you to enter your email address only. You will be receiving regular backup emails having compressed file of your database. Yes, the compressed file will not put much load on your disk if you download it through your configured email client like windows live mail, thunder bird, Microsoft outlook etc. Now question is this, how will it work? Here is its functionality explained. It will save your settings on your disk having daily, weekly, monthly or yearly setting upon your selection with your email address. A request will be made to the WordPress plugin provider domain which will note that what plan you selected for backup, nothing more. On that domain, a Cron Job script will be running on daily, weekly, monthly and yearly basis. There will be a script on your domain which will backup, compress and email it to you but that file will be called through a remote domain to provide you convenience that you don’t need to set a cron job on your server. This is an optional thing, if you are familiar with cron job commands so you can choose the custom box from cron job settings. Cron job command syntax varies server to server so you have to write it according to your server. This is the simple but elegant solution which will bring a feel of relax in your life when you will see an email on regular basis having your database backup. Is there any plugin like that? 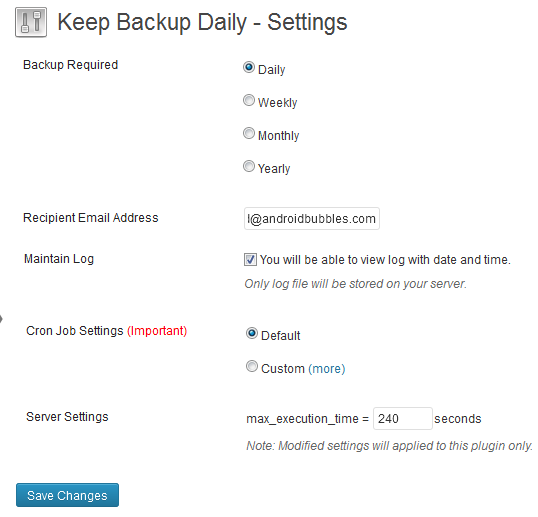 Yes, there is a plugin with the name “Keep Backup Daily“. You can download it from here. Is there any security bug in this plugin? It is related to the content and if someone gets the database so he can misuse it. No, there is not any straight forward security related problem exists because no database or table(s) are using in this plugin so eliminate the possibility of SQL injection, XSS and CSRF threats. This plugin is using only 1 file to store settings. Settings form is matching the encrypted key to secure your information and make sure that there is no CSRF (Cross Site Request Forgery) involved. That file saves certain parameters which are not dependent on form submission only but also validating relevant field and data type. So if your email address can’t be modified so no chance of DB backup misuse.